Omori holiday home with stunning lake views in a fabulous setting. 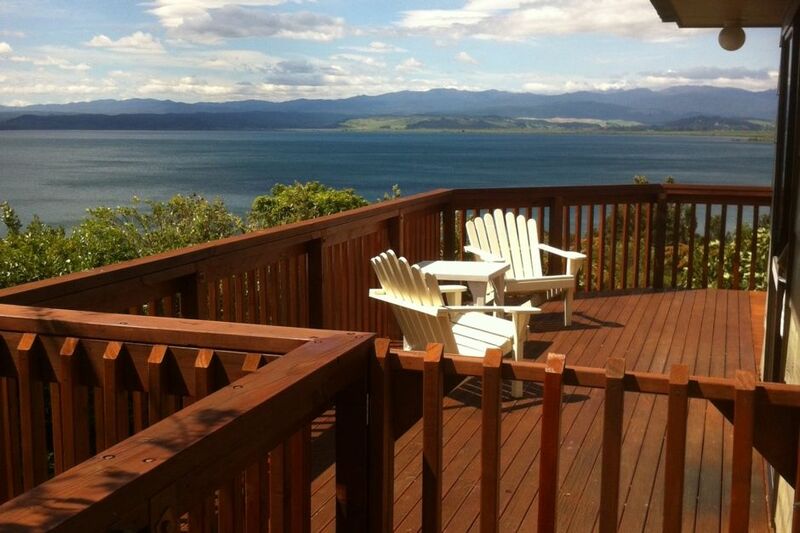 The living is upstairs with huge deck and view over Lake Taupo. Child friendly with gate onto upstairs deck. There are two bedrooms upstairs and one downstairs with external access. Porta cot and high chair are available. Two bathrooms. Open plan kitchen dining lounge area, easily heated. Only a short walk to the lake shore. Close to tennis courts, boat ramp, and children's play area. 10 mins to the Tokaanu thermal hot-pools and mud pools and 15 mins to the Turangi township. 40 mins to Taupo and Whakapapa Ski fields. Walk over the road to the local convenience store, petrol and fantastic Fish and Chips and hamburgers. Great for trout fishing and scenic bush walks around the lake. A great place to get away from it all. 3 nights minimum stay. Easter min. of 4 nights rental. Anniversary, Waitangi Day, Anzac, Queens Birthday, Labour weekend, min. of 3 nights rental. Linen not provided but pillows, bedding (duvets etc) are provided. House must be left clean and tidy (as found). Close to Whakapapa, mountains and Tokaanu hot thermal pools. A lovely relaxing spot with great views and amazing bird life. All amenities needed were there. Thank-you! Bach had awesome views and great for families. Great view! Easy access to park. Great view! Easy access to park. We would gladly stay there again. The house is simple but have everything you need, the views are amazing and there is plenty of space. Everything was in working order and tidy. We had a great time, we recommend it. A stunning view of the lake. A stunning view of the lake. We had a 9 month old baby - the place was toddler proof. The porta cot and high chair were in good condition. The place was well looked after and very tidy. The bedroom downstair had its own shower and toilet (not internally connected with upstairs). Close to the Omori shop (1-2 min walk) and Taurangi township (15-19 mins, google maps). We had a very friendly cat called "Jack" visiting us - (S)he was very good with the baby, a very lovely cat. Great location and lovely place to stay.